Get rid of false alarms with facial recognition home security cameras. Ooma Smart Cam is a home security camera that uses innovative technology to recognize family, friends – and even your pets! How do facial recognition cameras work? Computer vision software scans for faces, then visually maps key contour points of a person’s face. These measurements are used to uniquely identify that particular individual. Then, you can manually tag the faces with facial profiles in the Ooma Smart Cam app so that the camera “knows” the person or pet entering the room. Instead of getting random home security notifications, you’ll start receiving tagged notifications for family members and people who frequently visit your home. For instance, the camera can let you know that your kids got home from school. This technology gives you greater peace of mind while you’re away. 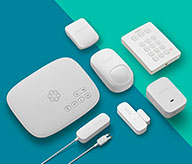 With a Home Secure or Business Secure subscription plan, you can take advantage of this great feature and reduce unnecessary notifications and false positives at your home or office. Note: There are several variables that can partially obstruct the camera’s view such as a new hairstyle, or the person looking down or wearing sunglasses. That’s why it’s important to continually update your facial profiles so that the camera’s built-in AI grows stronger and makes more correct identifications. For optimal facial recognition, place the Ooma Smart Cam at eye level. Benefits of facial recognition cameras. Facial recognition technology isn’t just innovative, it delivers practical benefits for homes and businesses. Less false alarms: No one likes getting security notifications they don’t need. With Ooma Smart Cam’s facial recognition, you’ll have less unnecessary interruptions to your day. Streamline your notifications: Since the camera can distinguish objects from people, you won’t need to view video to see who has entered your home. If your Mom’s face is tagged in the app, your notification will simply tell you that your Mom stopped by. It’s that simple. 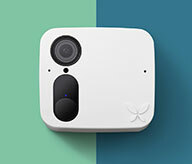 Ooma Smart Cam has many other innovative and practical features designed to make your life easier. Visit our features page to get more info about all of them and how they can help protect your home.